You know what it’s like… you are browsing looking for some info and suddenly get distracted by something else. What? Am I the only one who does that? So I saw this article on how to get a new blog filled with posts – and I’m always curious to see what tips people give. One of the questions raised was ‘How frequently should you post?’ and part of the advice given was to decide the frequency and the topics you want to post and use a schedule to keep on track, perhaps in a spreadsheet. Now I’m not that organised – you’ve probably noticed I tend to post when I think of something that might interest you or I want to share a discovery or a post from a valued guest author. But there was a link! To a great plug-in for a WordPress blog – an Editorial Calendar! Easily check the status of all your posts. Manage posts from more than one author, great if you have guest bloggers. I installed it on this blog and I used it to add and schedule this post. Take a look at this video – no affiliate connection – I just wanted you to see a great tool that you can use for FREE! How cool is that? Maybe I’ll go back to doing more regular posts like I did in the early days of this blog. My challenge – as it is for anyone hosting a blog – is finding topics that are fresh and interesting for my readers. Any suggestions on what you’d like to see on here? In this month’s post from Megan she explores the use of visuals on your website and in your online marketing. As a whole, people tend to be drawn to things that are visually stimulating. The internet is no exception. Have you ever been to a website and not been able to concentrate on the information that is offered because the design is either terrible or overdone? The look of a website, email, or internet ad is critical when it comes to gaining and keeping the interest of viewers. Quite a few internet trends, popular websites and social networks focus on the use of images. Facebook is used by many people to share personal photos. Companies also use the social networking site to share pictures of products, services, and even customers who are buying or using a product. Instagram is also a very popular photo-sharing site that both individuals and businesses are using to share photos. The most popular and one of the newest visually-focused websites is Pinterest. Businesses should definitely implement Pinterest in their social strategies. Pinterest exploded onto the social network scene recently. It gained popularity with individuals very quickly, and now businesses have caught on as well. Businesses are able to pin their own products and services, as well as sharing things that are related. Pinterest also has a very simple site design, so as not to take away from the pins that their users choose. A recent survey by Steelhouse shows that as many as 59% of Pinterest users have purchased an item that they saw on Pinterest. This compares to only 33% of Facebook users who have purchased something they saw on Facebook. To me, this shows that a visually stimulating website can absolutely help to drive sales. Another trend in online marketing and advertising is the infographic. Infographics are visually interesting graphics that depict information about any number of subjects. They are used by companies to convey information in a new and exciting way, rather than having people just read a large block of text. An infographic crams a lot of information into a compact space, making it more likely that readers will take in the information. Infographics should be creative and colorful. Having a visually interesting website is probably the best thing that you can do for your business. There is however, a fine line between a well-designed website and one that takes it over the top. Be cautious with your colour and pattern choices. Adding photos or videos of your product or the service that you offer is a good idea as well. Personally, I am much less likely to purchase a product that I can’t see first. And with a huge shift towards online shopping, images are more important than ever. Using interesting and relevant visuals to enhance your online presence is becoming more and more important. Consider adding visual interest to your website, social media pages, and marketing materials. You may see a significant uptick in sales! Megan Totka is the Chief Editor for ChamberofCommerce.com. Search the local business directory at ChamberofCommerce.com to find over 11 million listed businesses. Are you using visuals in your online marketing? Have you opened a Pinterest account? If so, how are you using it? Share your experiences in the comments below. oops – how things change! Back in 2003 I worked with a health clinic promoting their weight-loss programme. We had a good campaign with a specific, genuine headline that worked well – and I used it as an example in my books when I explained how using figures in your headlines can be extremely effective. Hmm – I haven’t written any weight loss campaigns since then so have not had any reason to check what can and can’t be used nowadays. But perhaps I should have confirmed the advertising standards before publishing the new edition of my ‘I Want To Buy..‘ book – my weightloss headline example is still there (on page 80). Why should I have checked? Shame really, because it is a good example of how to use specifics in a headline. So, if you sell health-related products in the UK, I suggest you pop over to CAP and read what they have to say before planning your advertising campaigns. In my post ‘Next Year and beyond‘ you’ll find a short guide for preparing your business for growth next year and beyond. In this article from Megan she offers five extra tips to help you make realistic, achievable goals. After the dust settles on the holiday season, and all the packages, bows and decorations are stashed away for another year, it is time to look ahead to the coming year. Whether you call them goals, resolutions or just hopes for the new year, these thoughts are often created with the best of intentions but not a realistic plan in place. The same is true of the goals for your small business. Mission statements and company philosophy have their places, but if you really want to boost sales and expand, you must make measurable, tangible benchmarks. Here are five suggestions on ways that small business owners can make, and meet, company goals in the coming year. Know your starting point. It would be very ambitious to set a goal of raising revenue by 200 percent in the coming year – but based on your business history, is this even realistic? Sit down with your numbers from this past year, and a few years prior, and look for patterns in growth. What percentage has your business increased each year for the past five? Does it continually go up, or are you at a stagnant point? Get a clear picture of what your small business looks like in the present before setting future goals. Set a goal and work backward. Once you come up with business goals that you want to reach before the end of the year, set smaller ones along the way. If expanding your social media following is on your list, set a number of followers and fans that you want to hit before ringing in the next new year and then break it down into smaller numbers each month. This will keep you from feeling overwhelmed at the larger number and also give you accomplishments to celebrate along the way. Spend wisely. It may sound like a business cliché, but every penny counts. Hire a local accounting firm to review your finances or analyze everything yourself. Decide where you can afford to make cuts and where you could be spending in a smarter way. Remember that the Internet has made it easier than ever to advertise yourself at little to no cost at all, so be sure you are taking advantage of all of those opportunities. Ask for help. Setting goals will motivate you, but sharing them with employees, business partners and family will make them more attainable. Let the important people in your life and business know what you plan to accomplish in the coming year and the ways that they can help you achieve those things. Make changes when needed. Even with hard work and smart planning, not all goals will be met. Do not be afraid to revisit your original plans and make adjustments as necessary. Of course, you may also find that you are surpassing your planned achievements more quickly than you anticipated. In that case, do not sit back and relax; up your expectations for the year and chase after your goals with just as much determination. If you really want to boost sales and expand, you must make measurable, tangible goals for your small business. Implement the five suggestions above to ensure company goals are met in the coming year. Megan Totka is the Chief Editor for ChamberofCommerce.com. ChamberofCommerce.com helps small business grow their business online. Megan also writes expert business advice. Over the next few weeks I plan to share some of the new insights from the updated edition of I Want To Buy – they may help you to achieve some of your business goals for next year. Anyone in business, especially a smaller business, knows about the famine and feast sales cycle. Unless your marketing strategy is constant and active – even when the order books are full – you are likely to experience an occasional lean time. But it may be that we sometimes create more famine than we need to when approaching a new prospect. Do we overwhelm our prospect with a feast of what we can supply giving them a dilemma of choice that they may decide to simply walk away from? 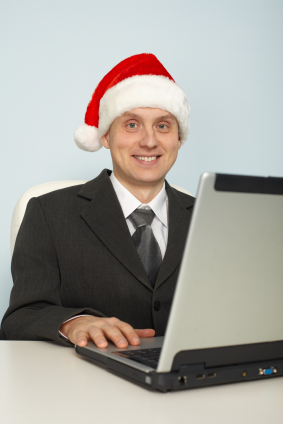 Does Playing Santa Work in Selling? Finally, after months of trying to get in to see one of your hot prospects, the day has arrived. The big meeting is set for early afternoon. Sitting by yourself at lunch, you’re planning what to cover in your one hour together. This may be the only chance you have to really show your capabilities, demonstrate your expertise or razzle dazzle your prospects with the breadth of your product line. Plus, you really need to update them about all the new things your company is doing. So much to say. So little time! Intellectually you know it’s important to focus on your customer and ask questions about their objectives, issues and concerns. But inside you’re in turmoil because you “have” to share all this information. If you’re like most sellers, the fear of missing out on a potential opportunity is just too overwhelming – especially when you may only get one shot at this company’s business. When you sit down in front of your prospect, even though you have good intentions of being customer-focused, it’s virtually impossible to do. Instead, like Santa Claus, you bring in your entire goody bag of products and services and spread them across your prospect’s desk. Brochures, samples, case studies and more brochures. They’re all out there for your prospect to pick and choose from. And, you can’t stop talking, “Stop me when you hear something you like! There’s bound to be something I/we do that you’ll be interested in.” Your prospect asks just enough questions to keep you going and verify that this was the right approach to take. But is this approach effective? Does playing Santa Claus actually work in selling? Unfortunately, the answer is a resounding “NO” when it involves dumping your entire goody bag under your prospect’s Christmas tree. By showing them everything you have, they can easily rule you out. Just because they have lots of options does not make them want to change. Plus, you sound like a peddler. That’s not the way to start a solid business relationship. However, I’m not suggesting you play the Grinch either. Find out what’s on his prospects’ list. What do they really need or want? What goals or objectives are they trying to achieve? What problems need resolution? The only way you can find out what’s on your prospects’ list is to ask really provocative, insightful questions – those that get them thinking. Make your own list of questions before your call so you’re not tempted to dump your goody bag. Check his list twice. When you uncover a need or problem, don’t jump on it right away. Explore it in depth finding out all the business ramifications and the pay-off for making a change. This means you ask more questions. Give them what they ask for. Prospects don’t want your product or service – only what it can do for them and their business. If you haven’t asked questions, you’ll never know if you can help them achieve their objectives or eliminate their problems. It’s important to remember that your initial meeting is about starting a conversation, not closing a sale. So please, don’t dump your entire goody bag all over your prospect’s desk. Santa wouldn’t approve! It’s not how he works. This article from Jill connected with me because it aligns with the advice I always give; trying to sell more than one product or service in your written sales message – especially in a direct marketing campaign – muddies the water and confuses your prospect and, potentially, results in you ending up with no sale at all! Thanks for allowing me to share, Jill. InsideView, a leader in sales intelligence, selected Jill Konrath as one of the 25 most influential B2B sales leaders for the 2nd year. Jill Konrath is proud to be selected as one of the top 25 most powerful thought leaders in the world of B2B selling, sales management and lead generation by OpenView Labs. you can use the insights revealed in the other 17 chapters to convert them into buying customers. The new book ‘I Want To Buy Your Product.. Have You Sent Me A Sales Message Yet?’ is now at the printers and I can hardly wait for the books to arrive so I can send them out to the eager business owners who have already pre-ordered. The good news: they don’t have to wait for the paperback book to arrive to read and start using all the valuable information this new and improved edition of ‘I Want To Buy..’ contains. Everyone who has requested the book has already got the PDF version to explore – FREE. Curious to know what the other 17 chapters contain? Take a look at the full table of contents (PDF file). “Whether you are new to sales and marketing or a stalwart of many years standing, you’ll find excellent practical advice in this book on how to write copy to increase your sales. The book bulges with useful tips based on the hard-won experience of Carol Bentley and her guest authors. My thanks must also go to my guest authors who contributed such a wealth of additional expert knowledge to this book. It has 4 more chapters than the original edition that was published back in 2005 as well as updates to the original material. This is the perfect Christmas gift for you and your business – or for a business colleague you think would benefit. Pop over to the special offer page to pre-order your copy now.